Just so you don't think that every post on Stonekettle Station is GWB bashing, here's my latest work. 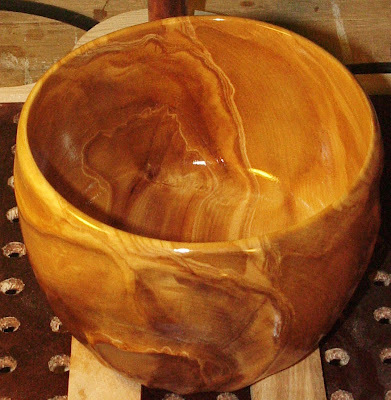 This is 2007#22, it is turned from an off-center cut birch blank. 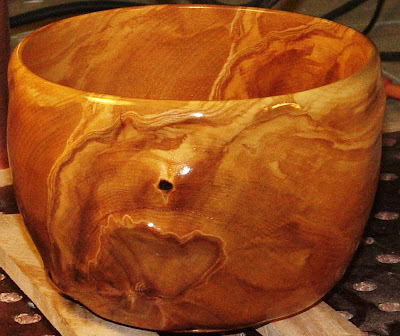 By off-center, I mean that the blank was cut off-center in the original log, leaving a blank that was about 2/3 heartwood and 1/3 sapwood - in the first picture the heartwood is the darker curly grained wood on the left side of the bowl. The clearer, lighter wood on the right is the sapwood. I think this makes an interesting contrast. The bowl is turned with thicker than usual walls, about 3/8". Then the outside is relief textured by hand, to emphasis the heartwood grain patterns. Which you can see better in the following picture. And just for the record, I bet Bush couldn't do this, Jimmy Carter could have though. Just another republican failing (Sorry, I just couldn't help it bawhahahaha!). That is absolutely lovely... you could drown in the perfect finish! ...you could drown in the perfect finish! Well, it's true Jeri that I've had several bugs do exactly that, drown in the finish. By all means, let's all stay in touch, mutual reenforcement and all that. I'll start posting material and progress reports next week. I want to get a bit further ahead in the project first.